... inauguration day of Obama! The world is watching... And so will we! But also: Daddy's birthday!! Double hurray! 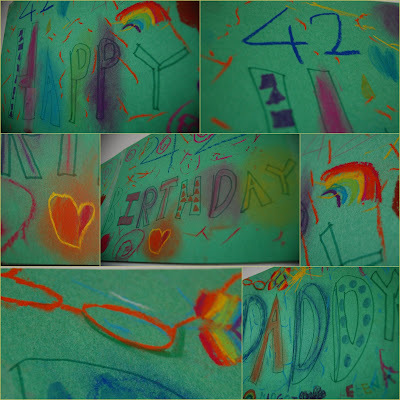 The girls have been really busy in anticipation of their Daddy's birthday. Last week they've secretly made this banner, a tradition by now in our household. I love the little details. Did you see the glasses? A little inside joke, as K. has been complaining about his sight lately. They found it hilarious when he couldn't read the instructions on a package of rice noodles last week. Hence, the glasses! Also last week, they've made this painting. Together, we browsed through "The weekend artist"-book to find the concept. They decided to use the stamping method, using a plastic yogurt cup and an empty spice jar. M. came up with the idea of adding crosses -- kisses! -- in the center. Doesn't it look great? I only helped them painting the background. Everything else is theirs - including the choice of colors! Of course, they couldn't wait giving it, excited as they were, so he got the painting over the weekend, as an early gift. Me, however, I didn't come up with anything yet, I'm afraid...Bad planning, again! Update: I did find something! Cool, isn't it! Thanks to One Pretty Thing I discovered the Obamicon.me site where you can create these. Check it out!